Two important five-year planning documents earned wide approval at ICIMOD’s annual meetings, held 9-12 May at the headquarters in Khumaltar. The Strategy and Results Framework and Mid-Term Action Plan, 2018-2022, spell out the vision and road map for ICIMOD as the Centre enters its 34th year of working for mountains and people in the Hindu Kush Himalaya (HKH). The Strategy and Results Framework (SRF) reviews ICIMOD’s various initiatives and programmes and provides a holistic vision of how these will work towards a range of strategic results for improving lives and communities in some of the world’s most remote and challenging settings. The document places special emphasis on ICIMOD’s strategic results – the benchmarks by which the institution and its supporters can mark their success in achieving goals and impacts. The SRF forms the basis of ICIMOD’s Mid-Term Action Plan, 2018-2022, which, by contrast, delves into the finer details and planning that form the foundation of ICIMOD’s work. “If the Strategy and Results Framework lays out what we want to do, the [Mid-term Action Plan] shows how we’re going to do it,” Director General, David Molden, told the assembled board members. Both documents were developed in consultation with two Board committees – the ICIMOD Support Group (donor group) and Programme Advisory Committee – who also held bi-annual meetings earlier in the week, ahead of the Board of Governors. Deputy Director General, Eklabya Sharma, explained to the Board that early drafts of each document had been reviewed and vetted by the committees to ensure a consistency in approach and reasonability in outlook. As ICIMOD represents eight regional member countries in the HKH, the Centre engaged each individual country to a consultation meeting in the past year wherein they could express how they prioritize. These suggestions were incorporated in the drafting of both documents. The Mid-Term Action Plan touches upon every aspect of ICIMOD’s work from its outreach efforts through research and knowledge promotion, to the internal structure of its staffing, finance, and monitoring and evaluation. Among the notable differences in the new Mid-Term Action Plan was the addition of a new regional programme: Mountain Knowledge and Action Networks. This programme seeks to create new and strengthen existing partnerships to promote learning and community action throughout the HKH. The programme will draw upon the growth of the Himalayan University Consortium, while adding research capacity through the addition of the South Asian Network for Development and Environmental Economics (SANDEE). The forthcoming volume from the Hindu Kush Himalaya Monitoring and Assessment Programme (HIMAP) was also of special note to the Board. This network of more than 300 professionals and policy makers are producing a comprehensive environmental assessment of the HKH – the first of its kind for the region. The volume is due out in late summer 2017. 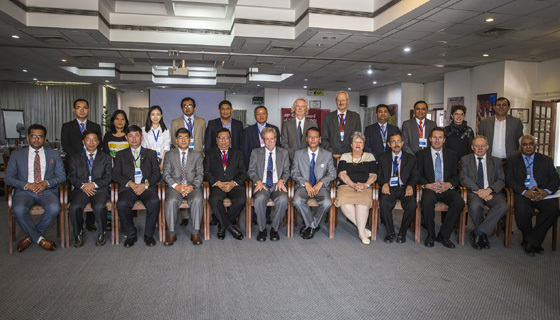 In other news, the ICIMOD Support Group elected a new chairperson, Peter Budd, Australia’s ambassador to Nepal. The Board of Governors thanked outgoing chair, Kjell Petersen, Ambassador of Norway to Nepal, for his many contributions to ICIMOD and mountains over the past three years.